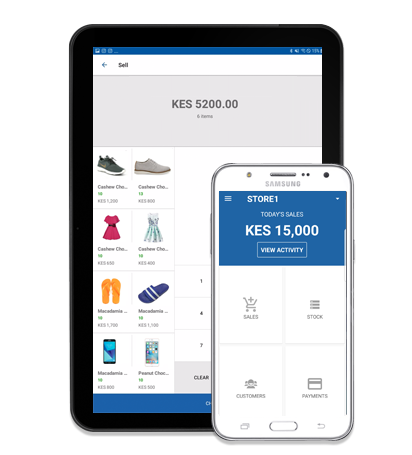 Duka Manager allows you to manage your business inventory, sales activities and make payments conveniently with a simple, convenient and free app. Understand what goods and services are popular with your customers, how your marketing and advertising efforts are impacting your sales and exactly how much revenue your business is generating. Develop profiles for your loyal customers and understand how and where they spend their money so you can develop reward schemes, understand their motivation and tailor your offerings to meet their needs. Accept mobile money or card payments within your shop with a multitude of payment options available to your customer. All these funds are then deposited to your Bank Account with 48 hours, allowing your the security and ease of digital payments. Install the App on your phone and register to get your Business. Input initial stock for the products you have within your shop. Start selling and track of your store day to day. Simple features to help you maximize your business returns. Track your inventory and with alerts in place for what products are running out. Track all your cash and credit sales and see the performance of your products and store. Track all payments that are being made within your store and know where you are spending. Track all sales and earnings in real-time with report showing each transaction. You can track all your credit customers to keep track of loyal customers . Offers secure process to manage your shop, while keeping transparency for all.